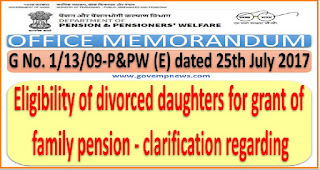 Sub: Eligibility of divorced daughters for grant of family pension - clarification regarding. Provision for grant of family pension to a widowed/divorced daughter beyond the age of 25 years has been made vide OM dated 30.08.2004. This provision has been included in clause (iii) of sub-rule 54 (6) of the CCS (Pension), Rules, 1972. 2. As indicated in Rule 54(8) of the CCS (Pension) Rules, 1972, the turn of unmarried children below 25 years of age comes after the death or remarriage of their mother/father, i.e., the pensioner and his/her spouse. Thereafter, the family pension is payable to the disabled children for life and then to the unmarried/widowed/divorced daughters above the age of 25 years. 3. 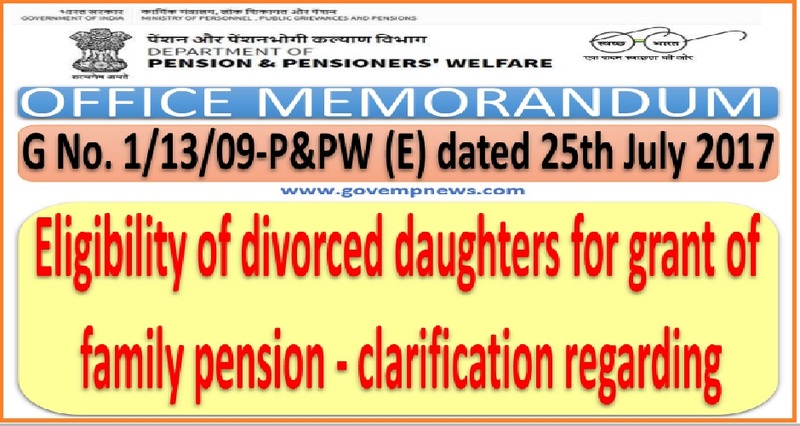 It was clarified, vide this department Office Memorandum of even number, dated 11th September, 2013, that the family pension is payable to the children as they are considered to be dependent on the Government servant/pensioner or his/her spouse. A child who is not earning equal to or more than the sum of minimum family pension and dearness relief thereon is considered to be dependent on his/her parents. Therefore, only those children who are dependent and meet other conditions of eligibility for family pension at the time of death of the Government servant or his/her spouse, whichever is later, are eligible for family pension. If two or more children are eligible for family pension at that time, family pension will be payable to each child on his/her turn provided he/she is still eligible for family pension when the turn comes. 4. It was clarified that a daughter if eligible, as explained in the preceding paragraph, may be granted family pension provided she fulfils all eligibility conditions at the time of death/ineligibility of her parents and still on the date her turn to receive family pension comes. Accordingly, divorced daughters who fulfil other conditions are eligible for family pension if a decree of divorce had been issued by the competent court during the life time of at least one of the parents. 5. This department has been receiving grievances from various quarters that the divorce proceedings are a long drawn procedure which take many years before attaining finality. 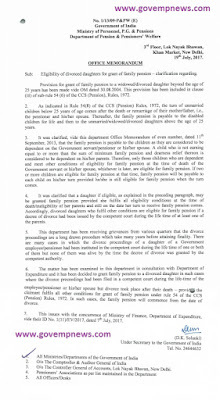 There are many cases in which the divorce proceedings of a daughter of a Government employee/pensioner had been instituted in the competent court during the life time of one or both of them but none of them was alive by the time the decree of divorce was granted by the competent authority. 6. 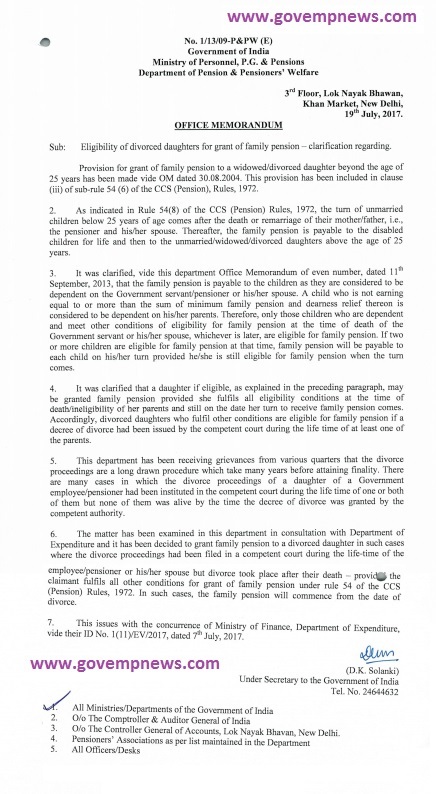 The matter has been examined in this department in consultation with Department of Expenditure and it has been decided to grant family pension to a divorced daughter in such cases where the divorce proceedings had been filed in a competent court during the life-time of the employee/pensioner or his/her spouse but divorce took place after their death – provided the claimant fulfils all other conditions for grant of family pension under rule 54 of the CCS (Pension) Rules, 1972. In such cases, the family pension will commence from the date of divorce. 7. This issues with the concurrence of Ministry of Finance, Department of Expenditure, vide their ID No. 1(11)/EV/2017, dated 7th July, 2017. 3. O/o The Controller General of Accounts, Lok Nayak Bhavan, New Delhi.